By Kori ~ July 30th, 2012. Founded in 2007 by brothers Pinto and Billo Naravane, Rasa Vineyards is a bona fide Washington wine superstar. Their beautiful winery is located south of downtown Walla Walla near the Washington/Oregon state line. Billo serves as winemaker and Pinto as managing partner, but the brothers collaborate on every aspect of the business. They both have engineering and mathematical backgrounds and worked in the computer industry. In November, they will be releasing their third vintage of wines. As you may remember, a Rasa Vineyards wine has been our pick for Best Washington Wine the past two years. Their 2007 Principia Reserve Syrah topped our list in 2010, and their 2008 Rasa Vineyards Creative Impulse took top honors in 2011. On a recent visit to Walla Walla, we tasted through their five upcoming releases and the overall quality of their lineup of wines continues to impress. Rasa is introducing two new wines with the 2009 vintage, a Bordeaux-style blend called â€œin Order to form a more perfect Unionâ€ and a single-vineyard Cabernet Sauvignon from Kiona Vineyard on Red Mountain called Plus One. Well, folks, the Naravane brothers have done it again. We gave the 2009 Plus One a 5-star Quality rating; it truly is another â€œWow!â€ wine. Rasa Vineyards offers their wines through their mailing list first. They are also distributed in 17 states. If you have not had a chance to try one of their wines, I encourage you to keep your eyes out for them on the shelf at your local wine shop or go ahead and put your name on their mailing list. Only open by appointment, Rasa Vineyards is definitely a must-visit if you are in the Walla Walla area. For a more detailed write-up about Rasa Vineyards, the Naravane brothers, and their winemaking philosophy, please refer back to my Spotlight On: Rasa Vineyards post. 2009 Rasa Vineyards Plus One Cabernet Sauvignon (Kiona Vineyard, Red Mountain, Washington): Deep, dark purple red. Amazing nose with gorgeous aromas of black fruit, chocolate, and floral notes. Big, bold black fruit, spice, and chocolate come through on the palate. Full-bodied with crisp acidity and high, dry tannins. Well-balanced with good complexity and a finish that goes on for days. An absolutely amazing wine. Wow! 2009 Rasa Vineyards Creative Impulse (DuBrul Vineyard, Yakima Valley, Washington): 71% Cabernet Sauvignon and 29% Merlot. Deep purplish red. Gorgeous nose with luscious cherry, spice, and a hint of smoked meat. Black cherry, red cherry, spice, and smoke come through on the palate. Full-bodied with crisp acidity and bold yet smooth tannins. Well-balanced with good complexity and a long, lingering finish. 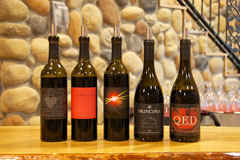 2009 Rasa Vineyards QED (Columbia Valley, Washington): 71% Syrah, 14% Grenache, 12% Mourvedre, and 3% Viognier. Deep purple in color. Aromatic with black cherry, cinnamon, and a touch of smoke on the nose. More black cherry, cinnamon, and some oak come through on the palate. Medium to full-bodied with crisp acidity and silky tannins. Well-balanced with a long, lingering finish. 2009 Rasa Vineyards Principia Reserve Syrah (Walla Walla Valley, Washington): 100% Syrah. Deep, dark purple-black in color. Nose is a bit tight at first and then black fruit, licorice, and smoke come through. Blackberry, black cherry, licorice, and smoke on the palate. Medium to full-bodied with lively acidity, and smooth tannins. Well-balanced with a long finish. 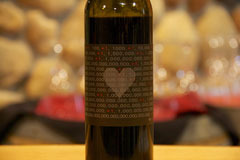 2009 Rasa Vineyards in Order to form a more perfect Union (Columbia Valley, Washington): 41% Cabernet Sauvignon, 36% Merlot, and 23% Cabernet Franc. Deep, dark purple. Nice nose with cinnamon stick, gingerbread, and red and black fruit aromas. More spice, red fruit, and a hint of green bell pepper come through on the palate. Full-bodied with crisp acidity, and medium to high tannins. Well-balanced with a long, smooth finish.